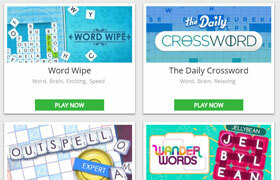 Our newest arena for casual word games, card games, brain games and lots, lots more! Play for fun or login to compete against other players from all around the world! Try your hand at more than 200,000 trivia questions across nearly two-dozen different categories. 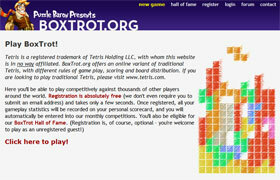 Compete with other registered players to make it into the Trivia Hall of Fame! You're given a bunch of wires, lightbulbs and a single battery. Your task: connect all the lights and wires to the battery to electrify the entire circuit, without creating any loops. 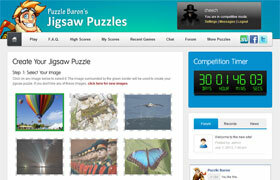 You're the park ranger in this puzzle! 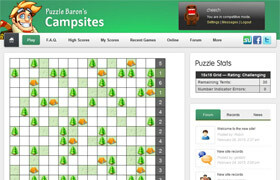 Lay out a set number of tents around the campsite (one for each tree) while adhering to the numerical requirements given for each row and column. Place lasers on the grid so that every empty square is bathed in green laser light. 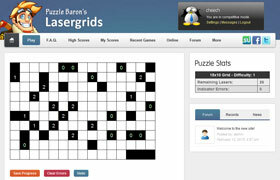 Play for fun, or compete with other registered players to make it into the Lasergrid Hall of Fame! Discover the unique layout of polyominoes that will satisfy the given grid. Play for fun, or compete with other registered players to make it into the Fillomino Hall of Fame! 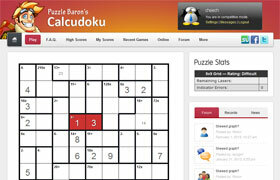 Whether you know them as Calcudoku, Mathdoku or KenKen(TM), we've got thousands of unique puzzles for you to solve, ranging from the easiest 4x4 to the most difficult 9x9. A series of numbers defines the grid - use only logic to uncover the hidden patterns. 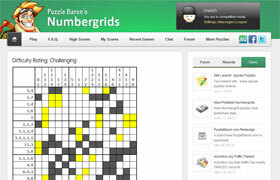 Play for fun, or compete with other players for the Numbergrid Hall of Fame! Think of it as a mix between a logic puzzle and a word search! Given a series of words and a partially-filled grid, your task is to place each word on the grid so that every square is used. Solve thousands of unique jigsaw puzzles, ranging across all sizes and difficulty levels. Play for fun or register an account to compete against other players for the Jigsaw Puzzle Hall of Fame! 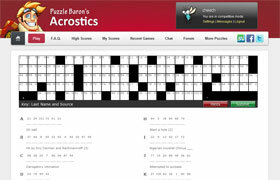 Sort of a mix between a crossword puzzle and a cryptogram, in an acrostic puzzle you'll gradually reveal the hidden quote by solving a series of crossword-style clues. Can you crack the code? Each puzzle presents an encrypted quotation - your job is to use pattern recognition, frequency analysis and plain old common sense to reveal the hidden quote. A cross between a math puzzle and a logic problem. Enter numbers into the grid so that each cell is equal to the sum of those adjacent, without using any number twice in the same section. Given a square board of either 16 or 25 letters, find as many valid English words as you can by combining each contiguous letter. Extra points are awarded for rare and unusual words! 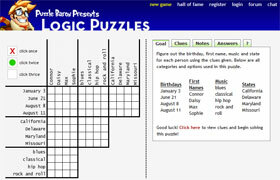 Take a simple set of clues and match up every item in four different categories using nothing but pure logical deduction. 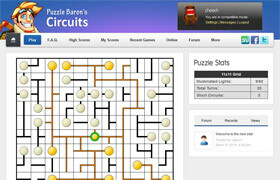 We provide a handy grid for each puzzle to help you along your way. 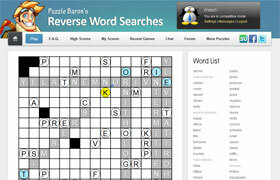 The scrambled letters of a famous quotation are provided in a series of columns standing above a crossword-style grid. 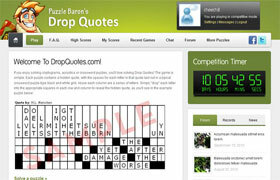 "Drop" each letter into the grid to reveal the hidden quote! 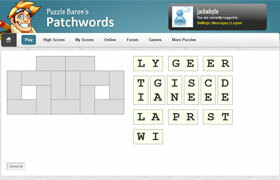 Find a series of related words in a grid of letters. 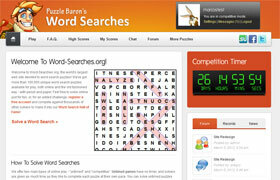 On this site you can play for fun or compete with others in timed games to make it into the Word Search Hall of Fame. 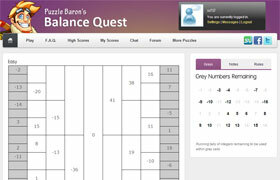 Prefer solving your puzzles the old-fashioned way, with pencil and paper? Then give this site a try. 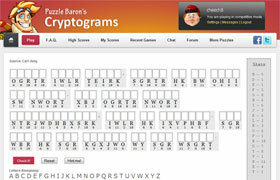 Crosswords, acrostics, cryptograms, logic puzzles, sudoku and more! 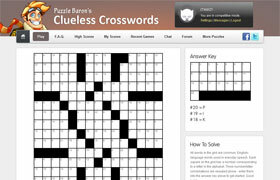 Solve these simple crosswords without ever having to read a clue! We give you three letters to start off with - use pattern recognition to fill in the rest of the grid. 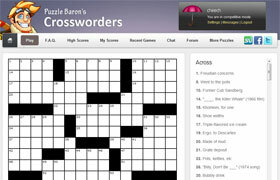 Want a quick crossword fix, but don't have time for an entire puzzle? 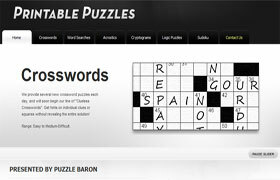 Crossword clues are given and a new letter revealed every 5 seconds. Can you solve it before time runs out? Can you reveal the hidden word or phrase before the hangman finishes his grisly work? Thousands of unique hangman puzzles are available here, separated into different categories. 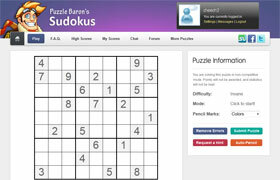 More than fifty thousand different sudoku puzzles, ranging from very easy to fiendishly difficult. Hints are available if you get stuck! See if you can enter the Sudoku Hall of Fame. 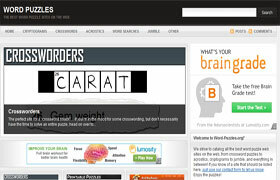 An index of some of the best and most popular word puzzle sites on the web. Simple reviews and ratings are provided for each site, with user comments and ratings enabled as well. Unscramble a series of words to reveal a hidden quote. Be careful though - some words can be unscrambled in different ways, it's up to you to find out which is correct! 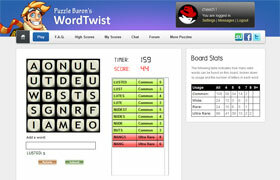 Shuffle around each two-letter tile on the gameboard until every row and column forms a valid word. 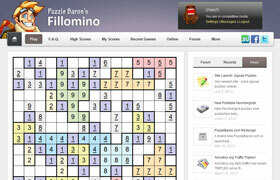 These puzzles can vary from the very easy to the maddeningly complex, so good luck! Drop different shaped tiles in a grid so that they interlock without any spaces in between. Interlock an entire row to make it disappear - and interlock four at once for a bonus. What is the 1st letter in wheel?